Varicose and spider veins are common anomalies in the lower extremities. These can creep up from the foot to the thighs, causing pain in severe cases. Thankfully, advanced methods are now available for vein treatment and spider vein removal in Los Angeles to restore veins to good health as well as prevent further risk to cardiovascular health due to underlying factors. While varicose and spider veins may only appear to be cosmetic issues, they may actually indicate a more serious underlying problem affecting your venous system. The veins function by carrying blood from the body back to the heart. Normally, the valves in your veins serve as one-way flaps that prevent blood from flowing backwards. If the valves are damaged or weak, blood may flow back into the veins and accumulate, causing swelling and the appearance of large, twisted varicose veins on the surface of the skin. Spider veins are much smaller and often considered not dangerous. However, they may also indicate blood reflux deeper under the skin in some cases. Other causes include hormonal changes, injuries, and exposure to the sun. why do I have these ugly veins on my legs? Causes are varied. First we identify the root cause of painful varicose and spider veins. Most of the time they develop because of venous hypertension – increased pressure in the venous system caused by inefficientleaky valves in the veins, or compression of iliac veins that slows the circulation system. radio frequency vein ablation, laser, or foam ablation, and reopen compressed veins with stenting. After that, we use sclerotherapy and microphlebectomy to get rid of ugly spider veins and remove the remaining ropey varicose veins. The condition can cause more than just varicose veins in the legs. It may also lead to swelling, itching and tingling, dull or sharp pain, cramping, skin discoloration around visible veins, deep vein thrombosis or blood clots, as well as skin ulcers. 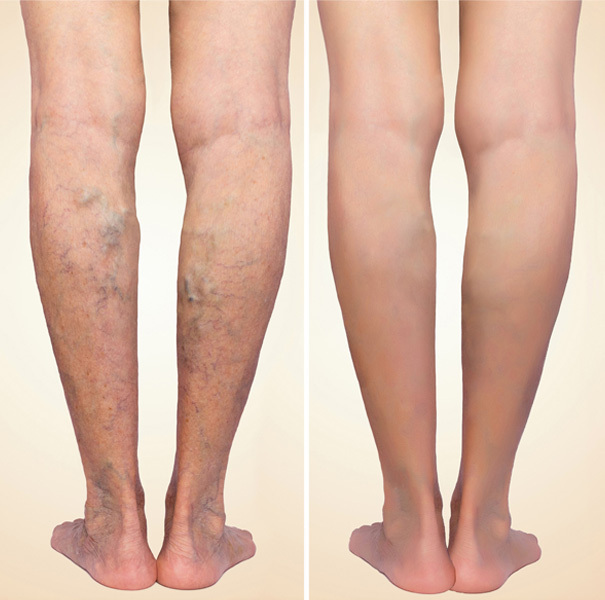 WHY TREAT VARICOSE VEINS AND SPIDER VEINS? As with your heart and arteries, any damage to the veins can significantly affect your entire health. This is why the Beverly Hills Vein and Cardiovascular Institute offers advanced methods of varicose vein treatment beginning with a thorough biochemical analysis of your health in relation to your 3-part cardiovascular system: your heart, arteries, and veins. This ensures that the best possible treatment is given. spider and varicose veins, Chronic Venous Insufficiency (CVI), deep vein thrombosis, and ulcers. As a recognized vein treatment center in Los Angeles, BHCVI employs the Madyoon method to evaluate the patient’s cardiovascular health completely and accurately. about your condition and treatment options.